This is the latest printed free software manual I’ve been working on – The Apache Reference Manual (for Apache version 2.2.17) (ISBN 9781906966034, RRP £19.95). It’s the biggest single volume I’ve published – over 850 pages. 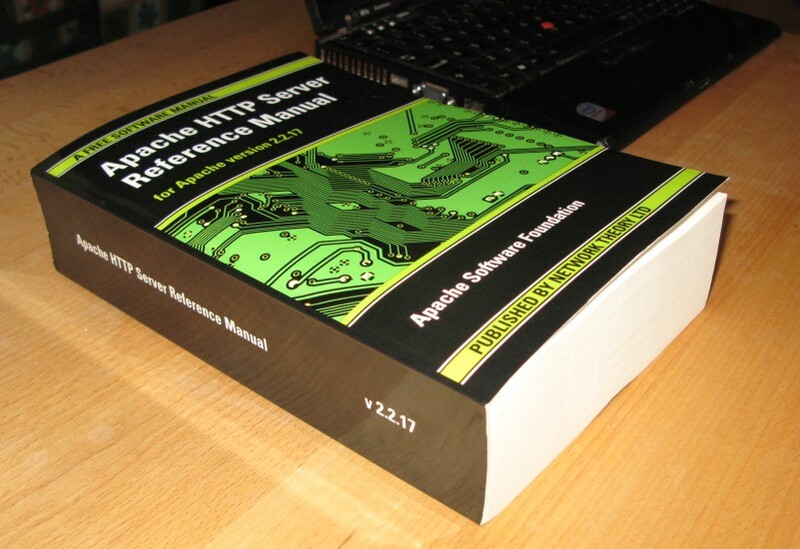 I’m donating $1 to the Apache Software Foundation for each copy sold. I’ve just published the PostgreSQL 9 Reference Manual (in 4 volumes) through my company Network Theory Ltd.
It’s over 1,600 pages, so proofreading it was quite a task! One of the side-benefits of publishing free software manuals is that I do get to know all the features of the software. The main new PostgreSQL feature that I’ll be using is full text indexing, for a Django site I’m working on. I was previously running PostgreSQL 8.2 on my server and updated it to PostgreSQL 9 yesterday to get support for this. Thanks to the new pg_upgrade migration tool in PostgreSQL 9 that should also the last time I’ll need to do the full pg_dump/pg_restore upgrade (always a bit of a hassle on a large database). Incidentally, for every volume of the manual sold I’m donating $1 to the PostgreSQL project. I was able to give over $2,000 from the sales of the previous edition for PostgreSQL version 8. Ted Nelson, inventor of the terms “hypertext” and “hypermedia”, has long had a radical view of computing and freedom for computer users. His 1974 book “Computer Lib” was an early manifesto for personal computing and computer literacy — before personal computers existed (the Apple I, the first assembled computer which displayed on a TV screen, didn’t arrive until 1976). His latest book is “Geeks Bearing Gifts – How the Computer World Got This Way” (ISBN 978-0-578-00438-9, £12.51), a personal history of computing and the forces that have influenced its development. The book covers a vast terrain from the ancient world through the first digital computers, ARPANET, NLS, Xerox PARC, microcomputers, Apple, Microsoft, free software, GNU and Linux, and the Web up to the present day. The style and content are quirky but it’s full of thought-provoking ideas and well worth reading. As always, Ted Nelson has a unique perspective. I have recently finished reading the book "Two Bits – The Cultural Significance of Free Software" by Christopher M. Kelty, Associate Professor of Anthropology at Rice University. In summary, the book examines the development of the free software movement from an anthropological point of view (it is based on research work done as part of the authors PhD thesis). The author identifies some interesting parallels between different endeavours involving freedom and the creation of information infrastructure, such as the development of internet protocols and free textbooks. It is published under the CC BY-NC-SA license.